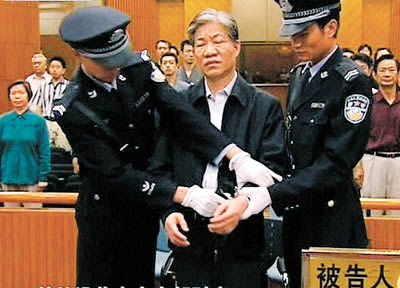 Eight years ago, the Chinese government took a rather drastic step to clean up fraud and corruption in its drug regulator - it shot the director of the State Food and Drug Administration. However, this has now been shown to be just another example of the uselessness of capital punishment as a deterrent, because the Chinese government has now announced ANOTHER crackdown on pharmaceutical drug registration fraud. Although not spelling it out as such, the Chinese ministry of health has basically admitted that there has been ongoing and widespread clinical trial fraud since 2008. Not exactly a ringing endorsement for the succesors to the hapless Zheng Xiaoyu (above). Despite efforts to correct the situation, the new director of the China FDA, Bi Jingquan (in office since 2015) has announced that the problems of clinical trial fraud have not been fixed. On 22 July he issued proclamation 117, which states that the China FDA is to review the registration applications for more than 1600 drugs, to verify the data as genuine. In a sign of how bad things are, the China FDA has described this as a "last chance amnesty" for all the naughty companies who have submitted false data to come clean. Leniency for those who confess ... and for those who don't - three years exiled in the wilderness. Yes, the China FDA is going to blacklist the drugs and companies that are found to have acted fraudulently - if they don't put their hands up and admit to it. They will be banned from re-submitting any drug registration applications for at least three years. Not surprisingly, the pharmaceutical industry is not happy with this situation. In fact, they are shitting bricks and calling it "7-22" - the industry's play on 9-11. They know the government means business this time because of what happened to GSK - the Anglo-US company was fined a whopping 3 billion yuan ($489 million) for dodgy goings on within its sales force. But to be fair on Big Pharma, it's not all their fault. The real villains are the so-called Clinical Research Organisations (CROs), which are agencies that actually do most of the local clinical trial work on behalf of the pharma companies. According to Caixin magazine, industry insiders acknowledge that the CRO sector in China is riven by fraud and corruption. Pharma companies pay the CROs to obtain the clinical trial data for China and submit it to the regulators. However, it's an open secret that the trials allegedly run in China's hospitals have been fixed or faked, and the regulators bribed or blindsided. To use the words of a regulatory agency insider, "the chaos has not been effectively curbed" since 2008 and therefore the CROs are being invited to undergo a period of "self examination" and verification of their results. The China FDA is tearing up its 2001 guidelines for drug registration and is starting afresh with more rigorous rules. The CROs have a chance to correct their irregularities or will be banished for three years. It is hope the shake-up will clean out what it currently a rotten and severely compromised sector - but this remains to be seen. Does this CRO fraud problem also apply to the Chinese studies of "TCM' and acupuncture? They are always positive, unlike elsewhere in the world. Good question - dunno the answer.